What started as a silly way for blogger Danielle Henderson and her classmates to keep track of the feminist theorists they were studying in class quickly turned into an overnight sensation. 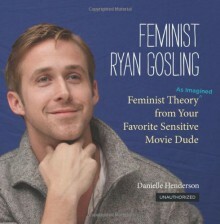 Since its launch in October 2011, the Feminist Ryan Gosling blog has close to 30,000 followers and more than 3 million page views per month.In this hilarious book based on the wildly popular blog, the author pairs swoon-worthy photos of the steamy actor with sensitive feminist theories and plenty of sweet talk. Included are 120 full-color photos and captions throughout, with some of the best entries from the blog along with 70 to 80 percent brand-new material for the book. This is funny. With references to Derrida, Lacan, Butler, Chicago, Grier and a plethora of theorists and activists this is smart and the tongue in cheek bites just hard enough.